Paddington, having settled with the Brown family in Windsor Gardens, has become popular in his community, offering people emotional support in various ways. To purchase a unique pop-up book of London in Samuel Gruber's antique shop for his aunt Lucy's 100th birthday, Paddington performs several odd jobs and saves his wages, but the book is stolen. Paddington gives chase, but the culprit escapes, and Paddington is framed and arrested. Although Mr. Gruber and the Browns do not believe that Paddington stole the book, with no evidence that the thief even existed, Paddington is wrongfully convicted and jailed. The thief soon returns home and is revealed to be Phoenix Buchanan, an egotistical actor who lives opposite the Browns. Whilst in prison, Paddington befriends many of the inmates, including the short-tempered chef Knuckles, who hires Paddington, impressed by his marmalade sandwich recipe. The Browns work to clear Paddington's name, putting up sketches of the thief. Buchanan begins using the pop-up book to locate a series of clues within London's famous landmarks, which he believes will unveil the location of a secret treasure. During their efforts to prove Paddington's innocence, the Browns encounter a fortune teller who informs them that the stolen book leads to the hidden fortune of the original author. With Paddington inside, the prison is a much livelier place, but Paddington struggles to remain positive when the Browns are unable to prove his innocence but keep hunting. Becoming convinced that Buchanan is the culprit, the Browns look for the stolen book inside his house. They find a secret attic where Buchanan's various costumes are stashed, including the costume of the thief. Before they can act further, Buchanan returns home and they are forced to leave. Meanwhile, the Browns have missed a prison visit with Paddington, causing Paddington to believe that the Browns have forgotten about him. Paddington soon takes part in a prison break alongside several other inmates, including Knuckles, who promises to aid in proving his innocence but promptly abandons the idea in order to leave the country as a free man, inviting Paddington to come with him. Paddington refuses and, whilst roaming the streets and avoiding the police, uses a public telephone to contact the Browns, who assert that Buchanan is the real culprit. To catch him, they arrange to meet at Paddington Station, where a carnival train carrying the supposed location of the hidden fortune is due to leave shortly. Paddington reaches the station and boards the train just as it leaves. The Browns pursue on another steam train at the opposite platform. When caught up, Henry Brown and Mrs. Bird board the other train and confront Buchanan, who overwhelms them and makes good his initial escape. Paddington is left stranded in the train's rear carriage, the coupling of which Buchanan severs, leaving it to crash into a nearby river. Mary Brown tries to rescue Paddington but struggles to open the locked carriage; she is soon assisted by Knuckles and the other inmates, who have had a change of heart and decide to help Paddington as promised. Eventually, Henry knocks out Buchanan just as he tries to access the so-called treasure, and he is promptly taken into custody. Paddington, now declared innocent, becomes very ill after the events, slipping into a short three-day coma yet recovering upon waking up on Lucy's birthday. With the book taken in as evidence by the police, Paddington is left disappointed that he was unable to buy Lucy a present as promised, but soon discovers the Browns, with the help of various other people in the neighbourhood, made sure Lucy could come to London and see it for herself. When answering the door to her, Paddington rushes up and hugs her, wishing her a happy birthday. Meanwhile, Buchanan is sentenced to 10 years in prison. Six months later, he is shown to be putting his experience as a performer to further use, hosting shows for the inmates and providing entertainment throughout the building. Hugh Grant as Phoenix Buchanan, a faded and narcissistic actor reduced to making adverts for dog food. In April 2015, David Heyman, the producer of Paddington (2014), confirmed that a sequel was in development. It was also announced that Paul King would return to direct, and co-write the screenplay with Simon Farnaby. Heyman's Heyday Films, and StudioCanal, produced the film. By October 2016, most of the cast of Paddington — Hugh Bonneville, Sally Hawkins, Julie Walters, Jim Broadbent, Peter Capaldi, Madeleine Harris, Samuel Joslin, Ben Whishaw and Imelda Staunton — were confirmed to be returning for the sequel, joined by Hugh Grant and Brendan Gleeson. Principal photography began on 18 October 2016. Many of the domestic interiors were filmed on stages at Pinewood Studios and Warner Bros. Studios, Leavesden, but producers also shot at key central London locations like Tower Bridge and St Paul's Cathedral. Jonah Coombes, supervising location on both Paddington and the sequel, stated, “We were looking for locations that celebrated London and delivered the kind of cinematic scale we were looking for.” Framestore provided the visual effects for the film, including the elaborate pop-up book sequence. On 7 February 2017, filming featured in the CBBC documentary series All Over the Workplace. Filming took place in London’s Little Venice for three days, and also at Shepton Mallet Prison and Knebworth Park. Principal photography ended on 27 June 2017. Michael Bond, the creator of Paddington Bear, died the same day, and the film was dedicated to him. The music of the film was composed by Dario Marianelli. Paddington 2 had its world premiere in London on 5 November 2017, and was theatrically released in the United Kingdom on 10 November. It was released on 6 December in France, 7 December in Germany, 21 December in Australia and New Zealand, and 12 January 2018 in the United States. StudioCanal distributed the film in the United Kingdom, France, Germany, Australia and New Zealand. The film was originally set to be distributed by The Weinstein Company and Dimension Films in the United States through their sub-label, TWC-Dimension, as the last film was. Following the sexual abuse allegations against Weinstein Company founder Harvey Weinstein, Heyday Films and StudioCanal looked for another American distributor for Paddington 2, because they believed that a film for children should not be associated with the Weinstein scandal. In mid-November 2017, Warner Bros. Pictures, which distributed Heyman's Harry Potter films and was already distributing the Paddington films in Spain, acquired the film's North American distribution rights for $32 million (£24 million), making it the first film in the series to do so. From 9 October 2017, five pop-up installations of Paddington's pop-up book, featured in the film, were placed around London, at Peter's Hill, Tower Bridge, Paddington Station, Peninsula Square and Bankside. The event was promoted by Visit London. The launch was attended by Hugh Bonneville and Mayor of London, Sadiq Khan. On 16 October 2017, Prince William, Duke of Cambridge and Catherine, Duchess of Cambridge attended a Paddington 2 charity event at Paddington Station, along with some of the cast and crew of the film. A video game based on the film, Paddington Run, was released on iOS, Android and Windows Phone devices on 25 October 2017. On 26 October 2017, it was announced that Paddington would appear in the 2017 Marks & Spencer Christmas advertisement. A teaser was released on 4 November 2017. The advertisement itself was released on 7 November 2017 and had its television premiere on the Pride of Britain Awards 2017. Whishaw returned to voice Paddington, and the advertisement also featured Mark Benton and Angela Rippon. 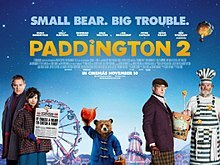 Paddington 2 was released on streaming platform Amazon Video on 5 March 2018. The film was released in the United Kingdom on Blu-ray, DVD & 4K Ultra HD Blu-ray on 12 March 2018. The film was released on Blu-ray and DVD in the United States on 24 April 2018 from Warner Bros. Home Entertainment. Paddington 2 grossed $40.4 million in the United States and Canada, and $186.4 million in other countries (including $59.4 million in the United Kingdom), for a worldwide total of $226.9 million. In its first weekend in the United Kingdom, the film grossed $10.9 million (£8.3 million), more than the first film ($8/£6 million), becoming StudioCanal's highest grossing film opening weekend in the United Kingdom to date. In its second weekend, the film dropped 20% and grossed another $8.8 million (£6.6 million). In the United States and Canada, Paddington 2 was released alongside the openings of The Commuter and Proud Mary, as well as the wide expansion of The Post, and was projected to gross $15–17 million from 3,702 theatres in opening weekend. It made $2.4 million on its first day and $11 million over the weekend (including $15 million over the four-day Martin Luther King Jr. weekend), finishing 7th at the box office, and marking a near-50% decline from the opening of the first film. It made $8 million in its second weekend, dropping 27% and finishing 6th. On review aggregator Rotten Tomatoes, Paddington 2 has an approval rating of 100% based on 226 reviews and an average rating of 8.75/10. The website's critical consensus reads, "Paddington 2 honours its star's rich legacy with a sweet-natured sequel whose adorable visuals are matched by a story perfectly balanced between heartwarming family fare and purely enjoyable all-ages adventure." On 18 January 2018, it became the most-reviewed film ever to remain at 100% on the site, with 164 positive reviews, beating Toy Story 2, which had 163 positive reviews at the time. Lady Bird had previously beaten the record the past November, but registered a negative review at 196. On Metacritic, another review aggregator, the film has a weighted average score of 88 out of 100 based on 38 critics, indicating "universal acclaim". On French entertainment information publisher AlloCiné, the film has an average grade of 4.0/5 based on 22 critics. Audiences polled by CinemaScore gave the film an average grade of "A" on an A+ to F scale, the same score earned by its predecessor. Leslie Felperin of The Hollywood Reporter wrote, "Paddington 2 won't save the world, sadly, but its existence makes everything just that tiny bit better and more, well, bearable." Guy Lodge of Variety wrote, "Another near pawfect family entertainment, honouring the cosy, can-do spirit of Michael Bond's stories while bringing them smoothly into a bustling, diverse 21st century London — with space for some light anti-Brexit subtext to boot." Peter Bradshaw of The Guardian wrote, "The film is pitched with insouciant ease and a lightness of touch at both children and adults without any self-conscious shifts in irony or tone: it's humour with the citrus tang of top quality thick-cut marmalade." In June 2016, StudioCanal CEO Didier Lupfer stated that the studio was committed to making a third Paddington film. In November 2017, David Heyman told Digital Spy that though the script for a third film had not been developed, discussions about locations, ideas and scenes had already begun. In November 2018, Heyman noted that a third film was likely to happen, but that Paul King would not be back to direct, though he would still be involved in a prominent creative capacity. ^ a b c d Ide, Wendy (27 October 2017). "'Paddington 2': Review". Screen Daily. Archived from the original on 26 November 2017. ^ a b Felperin, Leslie (26 October 2017). "'Paddington 2': Film Review". The Hollywood Reporter. Archived from the original on 26 October 2017. Retrieved 27 October 2017. ^ "Paddington 2 (2017)". British Film Institute. Retrieved 10 March 2018. ^ a b c D'Alessandro, Anthony (14 January 2018). "'Jumanji' Roars To $34M; 'The Post' Still The Most With $22M+; 'The Commuter' Punches $16M: MLK Weekend Box Office Update". Deadline Hollywood. Archived from the original on 14 January 2018. Retrieved 14 January 2018. ^ a b "Paddington 2 (2017)". Box Office Mojo. Archived from the original on 21 March 2018. Retrieved 15 April 2018. ^ De Semlyen, Phil (18 October 2016). "Paddington 2 starts shooting with Hugh Grant and Brendan Gleeson aboard". Empire. Archived from the original on 20 October 2016. Retrieved 20 October 2016. ^ Ellwood, Gregory. "From 'tragic character' to 'bad guy,' Hugh Grant takes his time picking roles". Los Angeles Times. Archived from the original on 1 January 2017. Retrieved 1 January 2017. ^ a b c Stolworthy, Jacob (18 October 2016). "Paddington 2 recruits Hugh Grant and Brendan Gleeson as filming begins". The Independent. Archived from the original on 20 October 2016. Retrieved 20 October 2016. ^ Radish, Christina (28 April 2015). "Paddington 2: Producer David Heyman Provides an Update on the Sequel". Collider. Archived from the original on 31 May 2016. Retrieved 20 October 2016. ^ Hopewell, John & Keslassy, Elsa (10 May 2016). "Cannes: 'Paddington 2' Sets Production Date". Variety. Archived from the original on 25 September 2016. Retrieved 20 October 2016. ^ a b c "Paddington 2 is in production with additional cast members". Paddington.com. 18 October 2016. Archived from the original on 27 October 2017. Retrieved 27 October 2017. ^ "Paddington 2 filmed London landmarks". The Knowledge Online. Retrieved 6 December 2018. ^ Kollewe, Julia (3 November 2016). "Harry Potter special effects firm looks east with sale to China group". The Guardian. Archived from the original on 4 November 2016. Retrieved 4 November 2016. ^ Failes, Ian (20 December 2017). "Inside Framestore's PADDINGTON 2 Pop-Up-Book Sequence". VFXVoice.com. Retrieved 27 March 2018. ^ "All Over the Workplace, Series 2: 7. Film-Maker". BBC. Archived from the original on 3 April 2017. Retrieved 2 November 2017. ^ "Paddington Bear film set staff 'acting like armed militia', say angry Little Venice residents". London Evening Standard. 18 November 2016. Archived from the original on 25 November 2016. Retrieved 25 November 2016. ^ "Paddington 2: Film starring Hugh Grant shot scenes at Shepton Mallet prison and stars local girl". Somerset Live. 28 January 2017. Archived from the original on 17 February 2017. Retrieved 17 February 2017. ^ Davies, Alan (9 November 2017). "Paddington 2 filmed in grounds of Knebworth House". Welwyn Hatfield Times. Archived from the original on 17 November 2017. Retrieved 17 November 2017. ^ Baillie, Katie (28 June 2017). "Hugh Bonneville learns of Paddington creator's death on last day of filming". Metro. Archived from the original on 28 June 2017. Retrieved 13 July 2017. ^ a b Marianelli, Dario (10 November 2017). "Paddington 2 (Original Motion Picture Soundtrack)". Apple Music. Archived from the original on 26 December 2017. Retrieved 26 December 2017. ^ "Hugh Grant at world premiere of 'Paddington 2' (VIDEO)". Malay Mail. 7 November 2017. Archived from the original on 2 December 2017. Retrieved 2 December 2017. ^ "Film: Paddington drops in again". The Northern Echo. 10 November 2017. Archived from the original on 10 November 2017. Retrieved 10 November 2017. ^ McNary, Dave. "'Paddington 2' Lands January Release in US From Weinstein Company". Variety. Archived from the original on 27 May 2017. Retrieved 27 May 2017. ^ Nyren, Erin (23 October 2017). "'Paddington 2' Producers Seek to Exit Distribution Deal With Weinstein Company". Variety. Archived from the original on 23 October 2017. Retrieved 23 October 2017. ^ Sweney, Mark (23 October 2017). "Paddington 2 backers thought to be seeking to cut ties with Weinstein Company". The Guardian. Archived from the original on 22 October 2017. Retrieved 23 October 2017. ^ "Weinstein Co. Buys Time to Seek a Buyer With Paddington Deal". Bloomberg News. 15 November 2017. Archived from the original on 16 November 2017. Retrieved 15 November 2017. ^ "Paddington's Pop-Up London". visitlondon.com. Archived from the original on 7 November 2017. Retrieved 2 November 2017. ^ Reporters, Telegraph (24 October 2017). "Paddington 2 featurette: watch the pop-up book behind the new London installations come to life". The Telegraph. ISSN 0307-1235. Archived from the original on 27 October 2017. Retrieved 2 November 2017. ^ "Pictures of the Day: 20 October 2017". The Telegraph. Archived from the original on 27 October 2017. Retrieved 2 November 2017. ^ Furness, Hannah (16 October 2017). "Duchess of Cambridge dances with Paddington Bear as surprise guest at children's event". The Telegraph. ISSN 0307-1235. Archived from the original on 2 November 2017. Retrieved 2 November 2017. ^ Sowden, Emily (14 September 2017). "Paddington 2's official mobile game, Paddington Run, will be made by Gameloft". Pocket Gamer. Archived from the original on 23 September 2017. Retrieved 23 September 2017. ^ "Paddington™ Run on the App Store". App Store. Archived from the original on 3 November 2017. Retrieved 2 November 2017. ^ "Paddington Bear set to star in M&S Christmas ad". Campaign Live. 26 October 2017. Archived from the original on 21 January 2018. Retrieved 13 January 2018. ^ "M&S reveals Christmas advert starring Paddington Bear". The Daily Telegraph. 7 November 2017. Archived from the original on 17 January 2018. Retrieved 13 January 2018. ^ Westbrook, Caroline (4 November 2017). "Have Marks and Spencer just given us a big clue about their Christmas advert?". Metro. Archived from the original on 7 November 2017. Retrieved 13 January 2018. ^ Howard, Kirsten. "Paddington 2 Blu-ray/DVD release date and bonus features". Den of Geek!. Retrieved 26 March 2018. ^ "Box Office: 'Paddington 2' Scores Biggest UK Opening for StudioCanal". Archived from the original on 22 November 2017. ^ "UK box office: 'Justice League' edges past 'Paddington 2'". Archived from the original on 20 November 2017. ^ Fuster, Jeremy (9 January 2018). "Can 'The Post' or 'Paddington 2' Knock off 'Jumanji' at MLK Weekend Box Office?". TheWrap. Archived from the original on 10 January 2018. Retrieved 10 January 2018. ^ D'Alessandro, Anthony (21 January 2018). "January Slows As 'Jumanji' Takes No. 1 For 3rd Weekend With $19M To $20M; Older Guy Pics '12 Strong' & 'Den Of Thieves' In Mid-Teens". Deadline Hollywood. Retrieved 28 November 2018. ^ "Paddington 2 (2018)". Rotten Tomatoes. Fandango. Retrieved 14 April 2019. ^ Vo, Alex (18 January 2018). "Paddington 2 Breaks a Rotten Tomatoes Record. Here's How Its Director Reacted". Rotten Tomatoes. Fandango. Archived from the original on 19 January 2018. Retrieved 19 January 2018. ^ Nordine, Michael (14 January 2018). "'Paddington 2' Is Giving 'Lady Bird' a Run for Its Money on Rotten Tomatoes". IndieWire. Retrieved 5 March 2018. ^ "Paddington 2 Reviews". Metacritic. CBS Interactive. Archived from the original on 11 January 2018. Retrieved 12 January 2018. ^ "Critiques Presse pour le film Paddington 2". AlloCiné (in French). FIMALAC. Archived from the original on 9 December 2017. Retrieved 13 January 2017. ^ Lodge, Guy (26 October 2017). "Film Review: 'Paddington 2'". Variety. Archived from the original on 26 October 2017. Retrieved 27 October 2017. ^ Bradshaw, Peter (26 October 2017). "Paddington 2 review – Hugh Grant steals the show in sweet-natured and funny sequel". The Guardian. ISSN 0261-3077. Archived from the original on 26 October 2017. Retrieved 27 October 2017. ^ "Truly Moving Picture Award". Heartland film. Archived from the original on 10 February 2017. Retrieved 10 February 2017. ^ Tartaglione, Nancy (19 December 2017). "'Three Billboards' Leads London Critics' Circle Film Award Nominations". Deadline Hollywood. Archived from the original on 6 January 2018. Retrieved 17 January 2018. ^ Dex, Robert (13 January 2018). "Discover all the nominations for this year's Evening Standard British Film Awards". London Evening Standard. Archived from the original on 13 January 2018. Retrieved 13 January 2018. ^ "The Shape of Water leads Bafta nominations". BBC News. 9 January 2018. Archived from the original on 9 January 2018. Retrieved 9 January 2018. ^ "IFMCA Award Nominations 2017". 8 February 2018. Retrieved 10 March 2018. ^ "IFMCA Award Winners 2017". 22 February 2018. Retrieved 10 March 2018. ^ Ritman, Alex (22 January 2018). "'Star Wars: The Last Jedi' Leads Nominations for UK's Empire Awards". The Hollywood Reporter. Retrieved 29 January 2018. ^ "The Los Angeles Online Film Critics Society announces their mid-season award nominees". Los Angeles Online Film Critics Society. 29 June 2018. Retrieved 3 July 2018. ^ "Los Angeles Online Film Critics Society releases their winners for mid-season film awards with A Quiet Place, Black Panther, and Hereditary leading". Red Carpet Report. 3 July 2018. Retrieved 3 July 2018. ^ Macke, Johnni (5 September 2018). "2018 People's Choice Awards: Complete List of Nominations". E! News. Archived from the original on 5 September 2018. Retrieved 5 September 2018. ^ "Children's in 2018". British Academy of Film and Television Arts. 24 October 2018. ^ "2018 WAFCA Award Winners" (Press release). Washington D.C. Area Film Critics Association. 3 December 2018. Archived from the original on 3 December 2018. Retrieved 3 December 2018. ^ "Los Angeles Online Film Critics Society Award Winners Announced! – LA Online Film Critics Society". Retrieved 8 December 2018. ^ Amidi, Amid (24 October 2018). "Legionnaires of Laughter Legacy Awards 2018 NOMINEES". Awards Circuit. Retrieved 24 October 2018. ^ ""The Hate U Give" Tops 2018 Indiana Film Journalists Association Awards". Indiana Film Journalists Association Awards (Press release). 20 December 2018. Retrieved 17 December 2018. ^ "'THE FAVOURITE' LEADS 2018 FLORIDA FILM CRITICS AWARDS NOMINATIONS". Florida Film Critics Circle Awards (Press release). 20 December 2018. Retrieved 19 December 2018. ^ "Austin Film Critics Release 2018 Awards Nominee Lists". The Austin Chronicale (Press release). 30 December 2018. Retrieved 29 December 2018. ^ "Los Angeles Online Film Critics Society Announces Its 2nd Year Nominations". 3 December 2018. Retrieved 4 December 2018. ^ "2018 EDA Award Nominees - Alliance of Women Film Journalists". Retrieved 21 December 2018. ^ Meares, Joel (11 January 2019). "Roma, Black Panther, and Netflix Dominate the 20th Golden Tomato Awards". Rotten Tomatoes. Retrieved 11 January 2019. ^ "46th Annual Annie Awards" (Press release). Annie Awards. 3 December 2018. Retrieved 3 December 2018. ^ Nordyke, Kimberly (9 January 2019). "Best Movies for Families - Movieguide Awards: 'Mary Poppins Returns,' 'Spider-Verse' Among Nominees (Exclusive)". The Hollywood Reporter. Retrieved 10 January 2019. ^ Barnes, Henry (20 June 2016). "Back fur more: Paddington films set for third instalment". The Guardian. Archived from the original on 28 December 2016. Retrieved 1 January 2017. ^ Sandwell, Ian (6 November 2017). "Paddington 3 is almost definitely happening". Digital Spy. Archived from the original on 7 January 2018. Retrieved 13 January 2018. ^ "Exclusive: 'Paddington 3' Is in the Works; Paul King Likely Won't Direct". Collider. 5 November 2018. Retrieved 5 November 2018. Wikimedia Commons has media related to Paddington 2.